If you need a large heavy hauler that looks good, has great features and even allows a medium of comfort and luxury, then the GMC Sierra 3500HD may just be something that ticks all your boxes. The truck enters the market at $35,290 and at that price it’s capable of trailering 23,300 lbs., which is mainly thanks to being available with GMC’s most powerful Duramax diesel lump ever. This 6.6-liter behemoth churns out 445 horsepower and 910 lb-ft of torque, but when size is needed and budget doesn’t match the truck can also be had with an E85 compatible 6.0-liter V8 with a saving of around $9,000. The cabin of the GMC Sierra 3500HD is spacious as you’d expect, even the regular cab is quite big, but it’s available with a double cab and the cavernous crew cab. The dash layout of the 3500HD is good, possibly one of the best looking in the truck range, but when you start adding in options and packages it becomes the perfect mobile office with almost sedan-like comfort and appointments. Driver and passenger space is really good, a family and some cousins can fit with ease, and there’s even storage compartments spread around to be able to pack away all their of daily travel items too. The popular, range-topping Denali trim is the lustful one, but the 12-way power seats and the electronic shift transfer case with rotary dial controls make it worthwhile. Another nice feature is the 7-inch touch screen heading up the infotainment system and navigation. For it’s sheer size and bulk, the GMC Sierra 3500HD had pretty good road manners akin to that of a big SUV. There’s not much feedback through the steering, but the assisted unit does make maneuverability much sharper than expected, and coupled to park distance systems you can confidently park the truck without wrecking your surroundings. The 6-speed automatic transmission is as smooth as you can expect in a big truck, and it makes for a nice drive too. Unladen it will shift in what feels like the right spots, and it feels much the same when hauling a load just with slightly different shift points. The massive torque feels really good though, and if the big motor weren’t so efficient, using the throttle to keep feeling the torque rush would use all your fuel. Braking can be scary, but the assistance to the system makes it feel better and more in control too, the transmission and exhaust brakes do their job perfectly. People wanting a big truck have the choice of gasoline or diesel when considering the GMC Sierra 3500HD, and both options are good. The gasoline-powered option is the big 6.0-liter Vortec powerplant; this E85-capable V8 is rated at 360 hp with 380 lb-ft of torque. For around $9,000 more you can have the monster Duramax diesel with a 6.6-liter capacity that’s touted to produce 445 horsepower with that great big 910 lb-ft of torque. There’s a 6-speed auto for the gasoline engine, but the diesel needs to use the 6-speed Allison automatic transmission thanks to a beefier build to ensure it doesn’t shatter under load and big torque stresses. 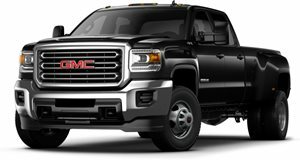 With the right ratios optioned, the GMC Sierra 3500HD can haul up to 31,300 lbs. Big trucks need big safety and the GMC Sierra 3500HD has all bases covered. There’s an array of airbags backed up by features like forward collision alert, lane departure warning, StabiliTrak stability control system with proactive roll avoidance and traction control. Equipment is plenty, and package dependent you can get a lot to make the cabin a very pleasant place to be. Dual zone climate control, a Bose audio system, a 7-inch touchscreen and the much-liked GM IntelliLink infotainment system are among the available options. There are a also options that are tailored to cold weather, so along with heated seating and a heated steering wheel, you can have a snow plow package with a power feed for both emergency and roof lights. The GMC Sierra 3500HD is the biggest truck in the Sierra lineup. It’s a massively imposing truck that can be a workhorse as well as a mobile office for a business if the need requires. It can be regarded as a Chevrolet Silverado in fancy dress thanks to sharing much with the this GM cousin, but for that difference you can end up paying dearly. The trim options and tech available are good, but if you want to get comfort levels way up, the price will match. The 3500HD does a good job of combining heavy-duty work with drivability and will be a good asset to any business, big or small.